Tax, quickbooks, accounting, midtown atlanta, 30308, 30309 - Oddo Brothers CPAs - since 1979! We are located 1 block south of the Fox Theatre. Between the Fox and the Bank of America Building. Peachtree Street, Ponce De Leon, North Avenue, and West Peachtree. Our office fronts on North Avenue. Click here for a bird's eye view of the area. For VISUAL directions, please see the VIDEOS at bottom of page!! Please note, if you are traveling from SOUTH of Atlanta, it's best to take the West Peachtree St Exit #249d. Then turn right on North Avenue. Then turn left into the parking DECK of our building. The reason you should take 249"d" is that you can't turn left on North Avenue when traveling North on Peachtree Street. So if you do take exit 249b, please don't turn left onto North Ave.
Free secure covered parking 8am-6pm. The parking is located just to the left of the building between the building and the public parking lot. After parking, enter the lobby, sign in, and our office is to your right. 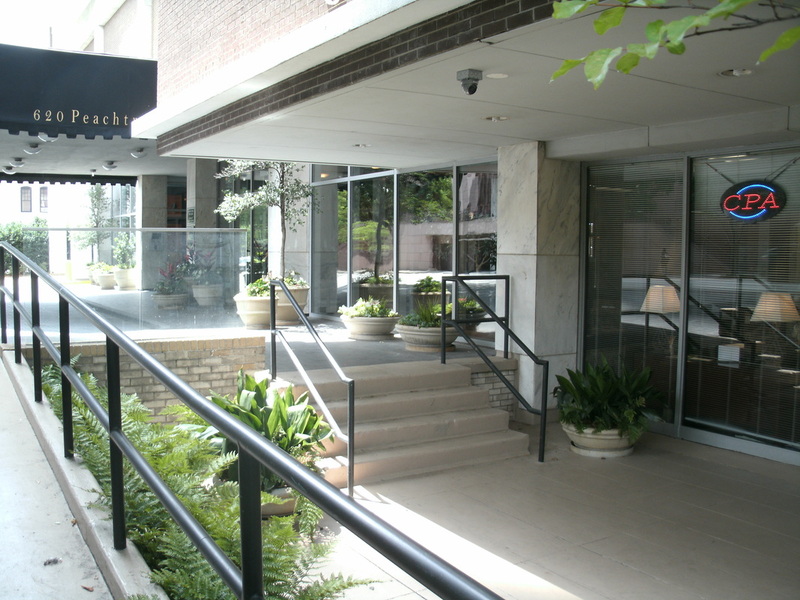 The North Avenue marta station is on the same block as our office. Just steps away from our office. There is a free 5 minute covered pick up or drop off location right outside our office. No need to enter the parking deck if you are just quickly dropping off or pickup up something. Once the video starts, you can select "full screen" for better viewing. Then press your ESC key to get back to this page.